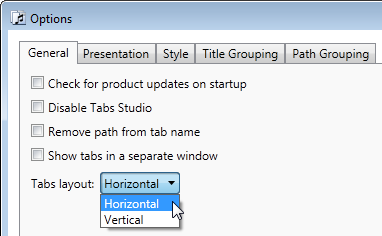 Tabs Studio v2.4.5 released: added the Close tooltip to the close tab button, fixed occasional change of selected extension in a tab in Visual Studio 2010 after switching to the full screen mode or starting a debug session. Download link: Tabs Studio v2.4.5. Tabs Studio v2.4.2 released: unified tab layouts to Horizontal and Vertical, added tab movement animation support for the Vertical tabs layout. Download link: Tabs Studio v2.4.2.